What do Wall Street, CrossFit and Vikings have in common? If you guessed Dr. Bill McCumber, you would be correct. 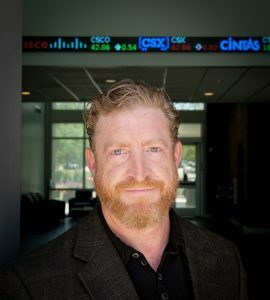 The JPJ Investments Endowed Professor of Finance and assistant professor joined the Louisiana Tech University faculty in 2013, and, over the past five years, has designed, developed, and implemented the College of Business’ Student Managed Investment Fund (SMIF)—the framework for the growth of applied investing education and experiential learning within the College. Undergraduate finance students in McCumber’s class made the initial $200,000 investment this past spring. Outside the classroom, McCumber focuses his research on financial networks — how firms, people, and finance are all connected. The former wealth manager uses a supercomputer built for this research to investigate, for example, how and why a hedge fund failure on Wall Street causes a global panic and losses of jobs on Main Street. He also owns Ruston’s Catahoula CrossFit along with a group of friends he met through the high-intensity fitness program that has swept the nation. He is a competitive CrossFit athlete, Certified Level 1 Trainer, and USAW Sports Performance Coach. McCumber is consistently recognized for inspiring students in the classroom, and, through his work as a CrossFit coach, athletes in the gym. He builds relationship, so it’s no wonder that intertwines with his research. His work is to define what those complex, inter-temporal financial networks and relationships mean for us. Oh, and the whole Viking thing? Like any good Norseman, he makes mead—the drink of the gods. Interested in our Finance program?